80 watts of pure flavor and performance, VooPoo's Rex 80W Starter Kit features the UFORCE tank which is known as a flavor tank with great coil technology backing it. Backed by the Gene Fit chipset this mod is smaller sized performer but an impressive one. Powered by a single 18650 battery with a power output range of 5 to 80 watts with a minimum resistance resistance level of 0.05 ohms and a maximum of 5 ohms, you'll find the perfect balance for your own vaping needs. 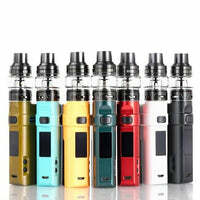 VOOPOO REX 80W & UFORCE Tank Starter Kit - VOOPOO has a rating of 4.5 stars based on 2 reviews.